Semi-Ocean Front-Southern Shores. Located along Ocean Boulevard in Southern Shores, this Florida Keys inspired tropical retreat has 4800 spacious sq. ft. w/ plenty of room for large family gatherings or quiet getaways. 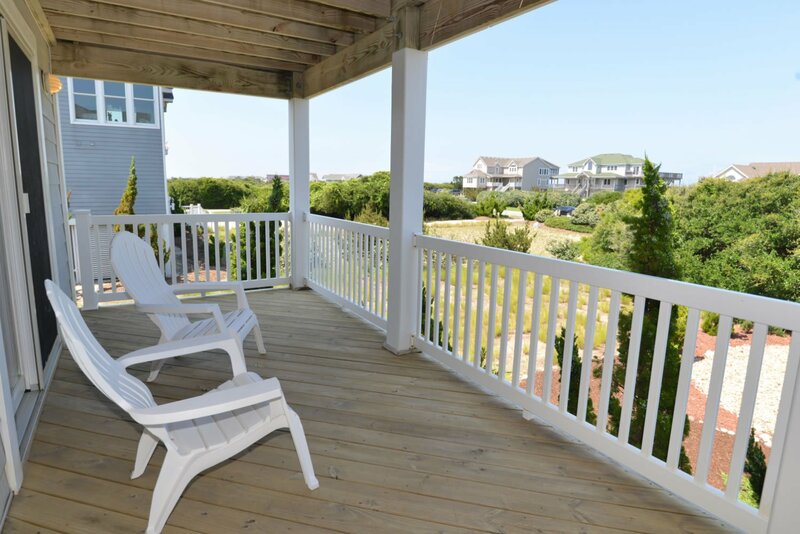 Enjoy great ocean views from every window on the third floor & the many decks. The Elevator gives you easy access to all three levels. Private getaway spaces include: a 3rd floor Florida room, a 2nd floor game room, & a 1st floor pool room. This home also has Seven Luxurious Master Suites, one of which is Handicapped Friendly on the Ground Level. Outside you will find an expansive Private Pool & Hot Tub that borders on an Eight acre nature preserve for bird watching & privacy. Easy beach access is only 200 ft. away. The paved bike & walking path that adjoin the driveway runs 2 miles south to shopping & 20 miles north for sight-seeing in Duck & Corolla. Ground Level: Parking for 6 Cars, 1 Car Garage, Access to Basketball Goal, Park Grill, Private Pool (35 x 15), 6 Person Hot Tub, Elevator, Rec. Room w/Pool Table, TV, Stereo, Full Refrigerator, Half Bath, Handicap Friendly Master Suite w/TV, DVD, Bath w/Roll in Shower, Roll Under Sink, Safety Rails, & Raised Toilet. Mid-Level: Large Front Porch w/Entry, Elevator, 5 Large Master Suites (2 w/Kings, 1 w/Queen, 2 w/Duo Bunks), 3 Masters have Deck Access, 3 have TVs, DVDs, Den w/TV, DVD, VCR, Sleep Sofa, Books, Games, & Deck w/Access to Pool. Top Level: Elevator, Great Room w/TV, DVD, Boom Box, Half Bath, Lookout Area, Dining for 18, Large Well Equipped Kitchen w/2 Dishwashers, 2 Microwaves, Massive Breakfast Bar, & Pantry, Ceiling Fans, Full Ocean View, Deck, Florida Room w/TV, DVD, Rear Deck w/Pool & Sunset Views. 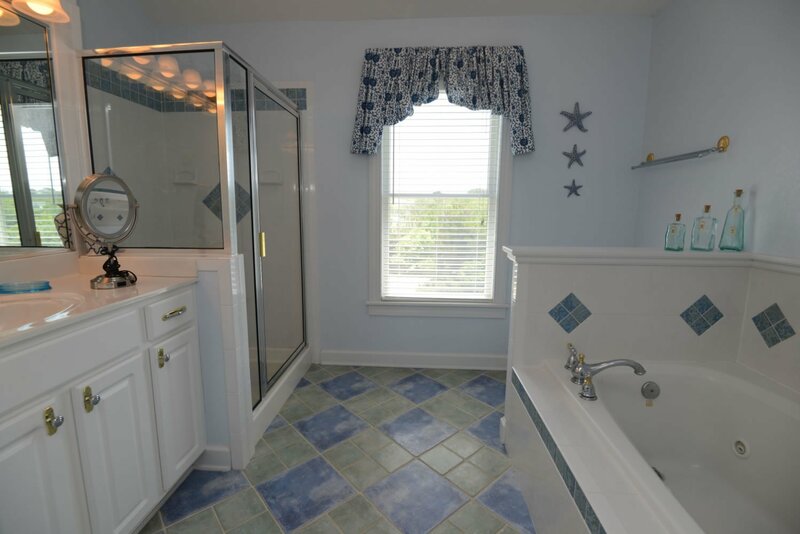 Large Master Suite w/King, TV, DVD, Jacuzzi Tub, Separate Shower, & Access to Private Ocean View Deck. 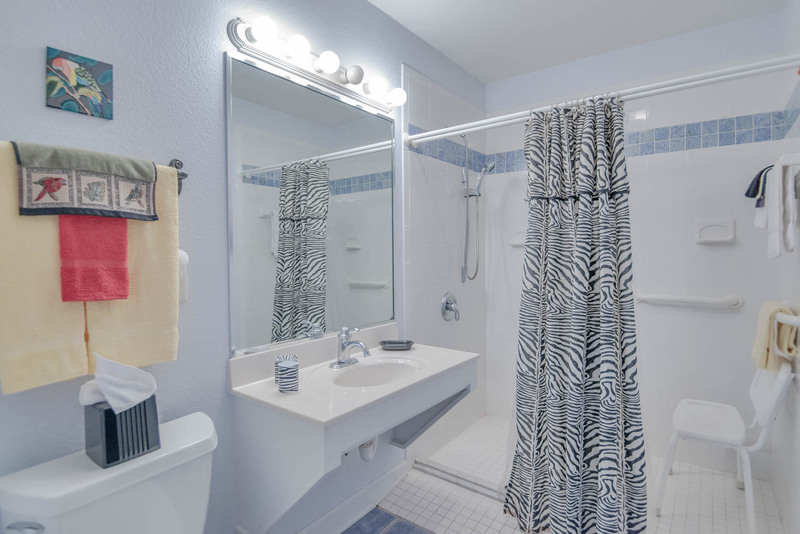 Features include: C/AC & Heat, Washer/Dryer, 2 Dishwashers, 2 Microwaves, 2 Refrigerators, 9 Flat Screen TVs, 8 DVDs, 1 VCR, 2 Stereos, Wireless Internet, Baby Equipment (Pack-n-Play, High Chair, Baby Gates), Ceiling Fans, Pool & Deck Furniture. A Member of the Southern Shores Civic Association (SSCA) which provides you w/No Fee Access to 4 Miles of Southern Shores Beaches w/Parking, Boat Launching Area, 3 Soundside Marinas, Soundside Bathing, Beach, & Picnic Area, Sea Oats Park/Play Ground, & Walking/Biking Trails, & Member SSCA Tennis Club. No pets. This is a Non-Smoking Unit. To see more about the community amenities visit the SSCA information page. Most beautiful home I've stayed in for the last 12 years (have always rented from Joe Lamb). My friends & I absolutely loved this house!! The property was absolutely beautiful. I've been bringing my family to the Outer Banks for 16 years (some smaller houses..some larger) & everyone said this house was their favorite. The house was great! Beautifuly decorated and it felt like home! Pictures are right on and our families very much enjoyed it!! It was all it appeared to be in the pictures we viewed. Beautiful home! We have a large family. This house was perfect. Loved everyone having their own bathroom off bedroom. Elevator was excellent for family as we had a health issue. No cleaning needed upon our arrival. Everything was very thought out. No need to take any games. Many located on each floor. Pool table kept teenagers happy at night. Great easy walk to beach. Crossing was three houses away. Kitchen very well stocked. LOVED two dishwashers !! Plenty of dishes, pans and cookware. Two coffee pots and blender. Wonderful layout !! Our families fourth home in OBX. This was voted best by everyone !! This home was awesome! The beach was super close, the house was beautifully furnished and very well stocked. If you are looking for a wonderful gathering place for your family...this one is it!!! Thank you so much for the many years you have allowed us to enjoy your lovely beach house. You have made it possible for my very handicapped mother to enjoy vacation.